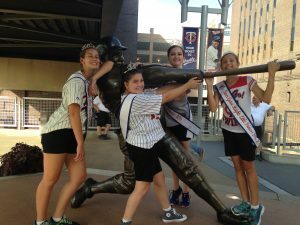 This past Tuesday, my royal family, as well as dozens of other royalty from throughout Minnesota, came together and supported the Minnesota Twins at one of their games. Every attending royalty was given the opportunity to walk the bases before the start of the game. Before we went out all the royalties had to wait below the stands and it was really cool to see so many visiting ambassadors in one place. 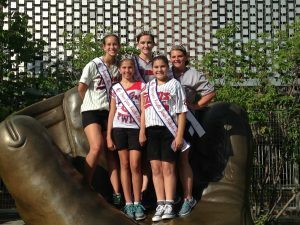 There were girls we see regularly, such as the Winter Carnival Juniors and Woodbury, but also girls from places like Winstead and Le Seuer, just to name a few. The weather was nice too, as what first started as a hot day, with the sun beating down on us, turned out to be a gorgeous evening. The Twins were playing the Atlanta Braves that evening, and although they lost, it was so much fun getting to spend time with Steph, Liv, Olivia, Hillary, and Taylor.